congrats, 94 backers pledged £4,550 to help bring this project to life ! Kuba-Laurence Harvey certainly falls into that category as well. 12 years ago he released his debut album in Liquid Sound Design. After several albums released in Chillcode Music, he returned to LSD for his latest, which is widely accepted that's as good as his first. Not many artists can do that. He also has numerous digital only releases scattered around in various EPs and compilations. And this is where Digital Reprints steps in. With your support we already have 5 released box sets and we want KUBA to be the 6th. 56 tracks, enough to fill 4 CDs presented in a beautiful package designed by Are Marmelade Siland. You can also get a bundle with Animalia for a special price or one of the 3 signed copies left. If you are not following Digital Repritns on bandcamp I suggest you do. Big day tomorrow. When the idea of Digital Reprints first came to me, almost 2 years ago, I'd never imagined the weight of the artists' names that I would collaborate with. 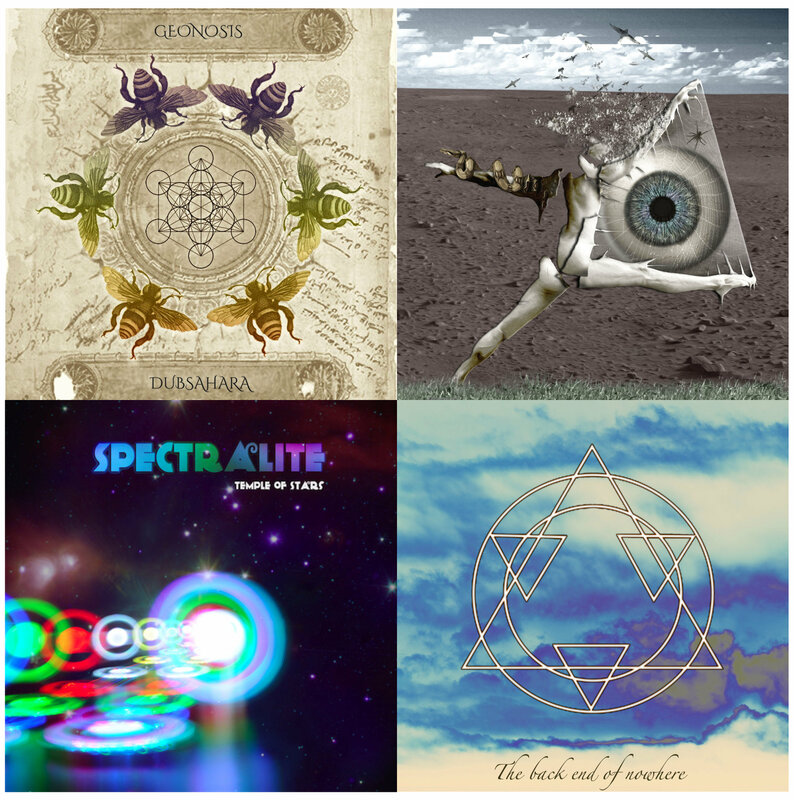 Entheogenic, Kaya Project, Globular, Cosmosis, Astronaut Ape and lastly KUBA. And now? A label whose releases I closely follow since 1994 (yes, I consider Dragonfly Records and Liquid Sound Design as one entity) is giving me the opportunity to be part of their vision. In true Digital Reprints manner (Limited, Hand-numbered) here comes a 4xCD digipack with a collection of some of their digital releases. To be released on time for holidays prepare for an amazing trip. The signed version is also massive, 4 different artists will sign only 10 copies worldwide for the lucky few. Suns Of Arqa, DUB TREES, Saafi Brothers and I-One come together to create a unique box set. Grab your copy now. So many artists out there that I would love to see their music printed on cds. But it makes it so hard for me to put them on a priority list because for me all of them are on the same spot, first place. So, to make it easier for me I decided to change my way of thinking slightly. It is time to surprise people, go back to the roots, to the artists that started this music genre, the legends. And the next project is a Legend. He was creating Psychedelic Dub when it didn't even exist as a genre. He worked with The Orb, Youth, Killing Joke, Derrick May, Juno Reactor, Juan Atkins and in groups such as Dub Trees and Celtic Cross. He has been involved in too many projects to list. He has used many monikers to present his musical creations, Dubsahara, Subsurfing, Metasurfing, Waveshaper, Alien Soap Opera and more. At this point everyone knows that I am talking for Mr Greg Hunter so any more words are unnecessary really. This is our chance to bring something really unique and proudly present it on our music library. 2.5 years, 6 Kickstarter projects and 7 releases. Digital Reprints started as a dream, materialised as a reality and expanded to an obsession. An obsession to bring as much quality music possible to the physical media. Media in the form of extremely limited (but still affordable) box sets, with cover art that does justice to the music and compliment each other in an onomatopoetic way. Just check our ratings on Discogs. I am asking for your help once more. Please remember that even if you don't plan to pledge please do share on your social media. Kickstarter relies on word to mouth advertisement so it really important. The music included has slightly changed. Plus 6 bonus tracks from Oïd Mü which will be available only digitally. The artwork will be designed by the talented Hakan Hisim. It will be based upon his ongoing art project, Universal Transmission. I found that the mysticism and the linguistic cipher used on the series fits so well with the tone set by Greg's sonic waves. Don't you agree?